고달사터에 세워져 있는 비로, 원종대사를 기리기 위한 것이다. 원종대사는 신라 경문왕 9년(869)에 태어나, 고려 광종 9년(958)에 90세로 입적하였다. 광종은 신하를 보내어 그의 시호를 ‘원종’이라 하고, 탑이름을 ‘혜진’이라 내리었다. 비는 일찍이 무너져 비신은 국립중앙박물관에 옮겨져 있으며, 이곳 절터에는 귀부와 이수만이 남아 있다. 비문에는 원종대사의 가문·출생·행적 그리고 고승으로서의 학덕 및 교화·입적 등에 관한 내용이 실려 있다 한다. 받침돌의 거북머리는 눈을 부릅떠 정면을 바라보고 있는데, 눈꼬리가 길게 치켜올라가 매우 험상궂은 모습이다. 다리는 마치 땅을 밀치고 나가려는 듯 격동적이고, 발톱의 사실적 표현은 땅을 꼭 누르고 있는 듯하다. 목은 길지 않아 머리가 등에 바짝 붙어 있는 듯 하다. 등에는 2중의 6각형 벌집 모양이 정연하게 조각되었으며, 중앙부로 가면서 한 단 높게 소용돌이치는 구름을 첨가하여, 비를 끼워두는 비좌(碑座)를 돌출시켜 놓았다. 머릿돌은 모습이 직사각형에 가깝고, 입체감을 강조한 구름과 용무늬에서는 생동감이 넘친다. 밑면에는 연꽃을 두르고 1단의 층급을 두었다. 이 거북받침돌과 머릿돌은 탑비에 기록된 비문에 의해 975년에 조성되었음을 알 수 있다. 거북의 머리가 험상궂은 용의 머리에 가깝고, 목이 짧고 앞을 똑바로 바라보고 있는 점, 비머리의 표현이 격동적이며, 특히 소용돌이치는 구름무늬의 번잡한 장식 등은 통일신라 후기에서 고려 전기로 진전되는 탑비형식을 잘 보여주고 있다. 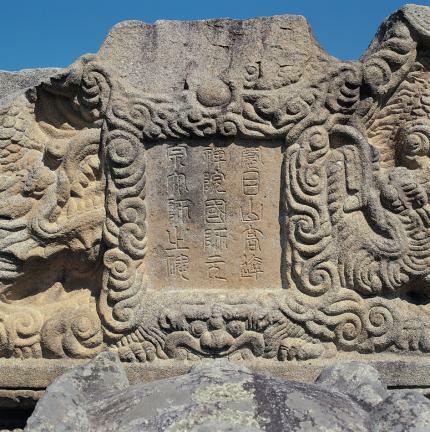 This stele was erected at the site of Godalsa Temple to commemorate the life and achievements of the Buddhist monk Wonjong, who was born in 869 (the 9th year of the reign of King Gyeongmun of the Silla Dynasty) and died at the age of 90 in 958 (the 9th year of the reign of King Gwangjong of the Goryeo Dynasty). 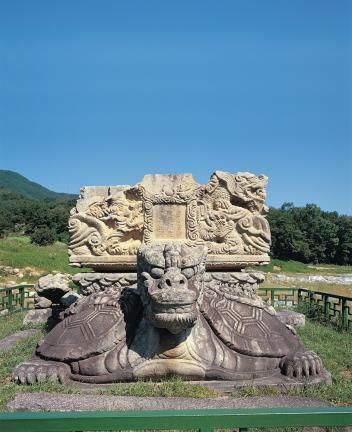 King Gwangjong bestowed the posthumous title of Wonjong upon him and named the monument ‘Hyejin’. 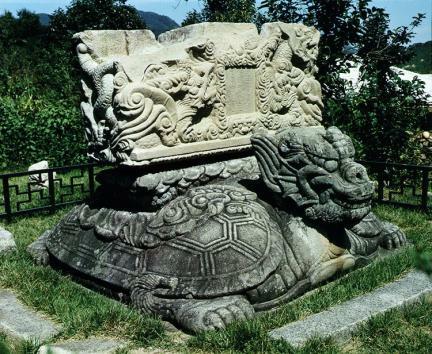 The actual stele was destroyed a long time ago, and only the tortoise-shaped pedestal and the ornamental capstone in the form of a hornless dragon remain today. 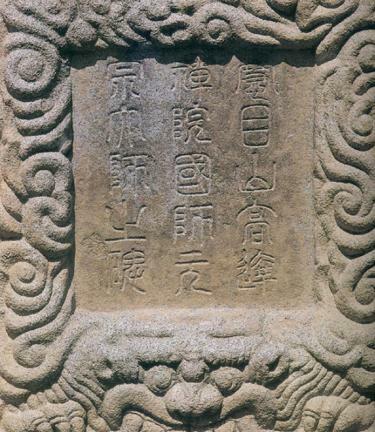 The stele’s broken main stone is displayed in the National Museum of Korea. Its inscription includes details about Wonjong's birth, life, achievements, learning and virtues as a monk. 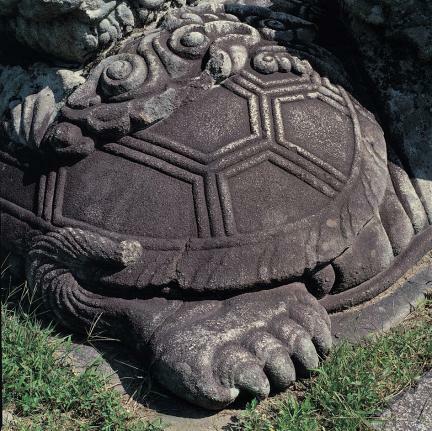 The tortoise pedestal is characterized by glaring eyes that seem to stare directly at the viewer, vividly expressed legs and paws, and a very short neck. 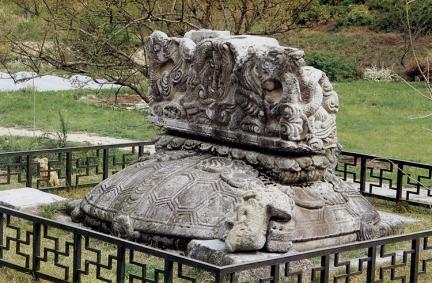 The back of the tortoise pedestal is carved with double hexagonal honeycomb patterns, while its middle part, which is one tier higher than the pedestal and is the part to which the main body of the stele is fixed, is adorned with swirling cloud patterns. 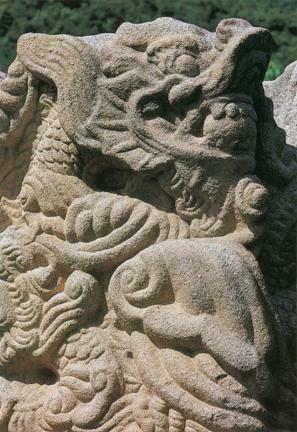 The ornamental capstone, which features a lively design of clouds and dragons, is almost rectangular; while its base is decorated with a lotus flower design. 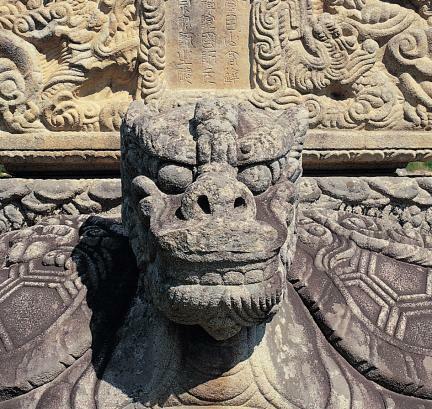 According to the inscription, the tortoise-shaped pedestal and the ornamental capstone were made in 975. 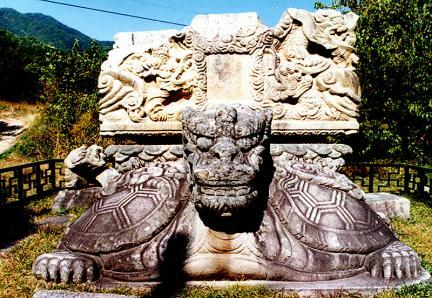 Judging from certain details such as the tortoise's face’s resemblance to a grim dragon, its short neck, glaring eyes, and ornamental stone, and especially the vivid and complex decoration with swirling cloud design, this stele dates from the period of transition from the artistic style of the late Unified Silla Dynasty to that of the early Goryeo Dynasty.